Posted on 04/20/2015 in Game Recaps, Team News. 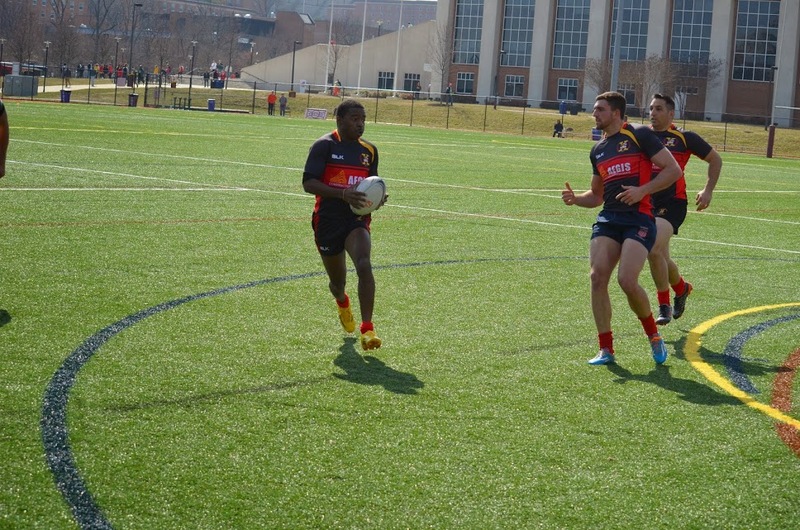 The Potomac Exiles hosted Schuylkill River on a beautiful Saturday, in what proved to be an early glimpse at next week’s playoff match. With a three seed still on the table, the visitors came out hot trying to avoid a first-round matchup against top-seeded Potomac. With some early miscues by the host, Schuylkill dominated possession early, playing deep in Potomac territory for the first ten minutes. The Exiles’ defense would not break, and the hosts eventually marched the ball down the field, earned a penalty and slotted an early 3-0 lead. Potomac would extend the lead to 10-0 with winger Mark McKinnon touching down the game’s first try 19 minutes into the game. At 35 minutes, the Exiles covered a deep kick beautifully and recovered the ball in the Schuylkill 5 meter line, but could not capitalize. River winger Sean Gormley picked up the loose ball off a sloppy ruck and took it 95 meters to tighten the score 10-7 and invigorate the visitors. The score would hold at halftime with both teams confident that victory was within their grasp. After 14 minutes of back-and-forth play, new fly half Ben Cima nailed his second penalty kick of the day to extend Potomac’s lead to 13-8. It would only take a few minutes for Schuylkill to respond, however, with some crafty passing along the sideline and the try in the corner to tie the game at 13 all. Eight minutes later the River fly would hit a penalty kick for the visitors’ first lead of the game, 16-13. With just eight minutes to play, Potomac knew they had their backs against the wall, but would not be denied. After some beautiful phase play across both sidelines, prop Jason “Dutch” Vanterpool shot through a hole and outraced the Schuylkill winger for the try to put Potomac back on top. Adjusting to Schuylkill’s “no ruck” defense, Potomac wound down the clock, grinding out some well-maintained pick and goes. With no time left, Cima sealed the victory with a 50 meter penalty kick for the final score, 23-16. While it was an important and hard-earned victory, the rivals will see each other again next week in VA in the first round of the MAC playoffs for the third matchup of the season. Potomac will try to put the final nail in the coffin, while Schuylkill tries to salvage the season series with the all-important playoff win. After a slow start, the Killer B’s rebounded for a sound victory, highlighted by strong play from Ballah Bookai and long tries from winger Joanell Joseph.